First I'll start off with my Public Service Reminder..
As you're about to see, I'm always looking for resources on old and new kits so that I can sim them in OpenRocket, or (hopefully) build or clone them someday. I'm sure that a lot of others are too. When you've got an old kit, please check to see if the instructions, fins, and decals are archived either at plans.rocketshoppe.com, or JimZ's site. If what you're building isn't there, or are somehow different, or the image they have lacks any kind of reference to it dimensions (including thickness), is bad (e.g. diecrushed fins), or they only have is a drawing of the fins, I'd ask you to scan yours with a ruler, and post them either here, at YORF, or at TRC (preferably all 3). Photos are good for documentation. But scans are far easier to gather information from. Did you know that Estes has changed its tags over the years? Sure! Who doesn't? Those tags can be really helpful for a BAR in IDing the variant they want (either on Ebay, or trying to clone). Including that information will help a lot of people. The longer a kit has been in production, the more likely that it has somehow evolved over time... Especially the older kits. Hand cut balsa gave way to diecut (crushed) fins. Balsa nosecones were replaced with plastic, then balsa, then plastic again. Shapes of nosecones evolved over time. Engine mounts have changed locations and sizes (Remember the short-lived short E motor Estes had back in the 90's?). Decals change on occasion (and not always for the better... (Estes Wizard)). Even body tubes have changed lengths (There's the Cherokee D with the 16.35" body tube that was later changed to a 18" body tube). All these changes lead to a plethora of variants (I'm looking at you Big Bertha... Alpha... and especially YOU, Omega! ), and there's always a chance that someone that is out there that is looking to create that rocket that they got (or didn't get) for Christmas, or their birthday that year. You'll help them (and me) if you can scan those instructions. Many times I've found that the drawings of a rocket's fins are off. Tracings outlined from them often causes them to become too large, or the angle or lengths that were given by the person doing it was off. There's nothing quite as frustrating as spending time trying to recreate your old favorite (including wasting valuable decals), only to have your eye constantly drawn to something that just seems... Off. Then to find that your resource didn't proof the drawing or measurements. RocketReviews.com has more than it's fair share of really bad .rkt files and poorly simmed fin templates. These things are gold... Nothing can bring a rocket to life quite as much as the colorful decals that came with a kit. Sure, there are those who don't want to have a cookie cutter version of their rocket (and more power to them). However, often it's the markings that drew many of us to a specific design. It'll help a whole lot of old BARs recapture that feeling of having an old rocket that they lost to time, or scratch that itch they had when they weren't able to buy/build the kit of their childhood dreams. Again, keep in mind that the longer the kit's been in production, the more chance that there have been changes to the decals. I've found that .png and .tif files are much more reliable for creating useful tracings of in making my .ork files. However, sometimes my browser doesn't like .tif files, making them a pain sometimes. Pdf files are great (sometimes), but I can't always right click and copy an image, making them a source of frustration as well occasionally. Then there's .jpgs. Jpegs are common, but extremely problematic for me. Unfortunately, my skills with high power (read: expensive, or feature laden) image processing software is very limited (by my knowledge on how to use them, or ability to purchase more intuitive versions). Jpeg files compress images in a manner that frequently makes finding edges a royal PITA. Toss in a curved edge, and the frustration only increases. DPI? Maximize this. 300 is good, 600 is better. Please remember to have a ruler in your scan, as well as indicating thickness of balsa, or other flat parts (oddball centering rings and the like). A Digital Micrometer is a very useful tool to have for gauging thicknesses. They aren't really expensive (mine was less than $20 USD at Harbor Freight (I brought mine with me to China)), and I'm sure you'll find it useful for other things once you've got one. NOTICE: My .ork files are intended to give the user the most accurate possible VISUAL simulation needed to create for themselves an exact as possible clone of the original rocket. Due to my use of "Phantom body tubes" and "Fin decals" to place things like launch lugs, stand-offs, engine hooks, decals, etc., the performance of the simulation will most likely NOT match the actual rocket. As such, it is up to the end user to update the downloaded file to suit their needs for flight performance. I take ownership of my files. I often improve them as I can, when I can. Please look for messages in the individual posts for edits that indicate that I've changed things. Sometimes these are for more accurate appearance, other times it's to implement new techniques I've developed that will improve the accuracy of the sim's visuals AND flight performance. As such, I sometimes will ask you to toss an old .ork file and download a fresh one. Ok, it feels like I've created one or two (hundred) Open Rocket files. I think it's time I go ahead and start posting the sims of the rockets in one place (as well as their scattered associated builds). The Cineroc was probably one of the most desired rockets out there back-in-the-day (maybe even more so now). Mint condition versions of the Cineroc can sell for hundreds of dollars on Ebay. The camera was designed by Mike Dorffler, and was introduced to the Estes lineup in 1970 beside the Cherokee D. The camera operates on two N cell batteries that were included with the Super 8mm film packets. Users would load the film cartridges, install the batteries, then have only a few seconds once the camera was started to get the rocket into the air. The cartridges were then sent into Estes for developing (if not done at home in a dark room), and the film was returned to the filmmaker. At least two versions of the camera were made (the earlier version lacked gussets at the joints with the battery's bulkhead, and the plate that attached it to the aft transition). Due to difficulties in film developing, as well as sourcing motors, and lenses, the Cineroc was discontinued in 1975. Users could modify their Cineroc by using an eyebolt added to the nosecone to get horizontal or "look down" views as the rocket returned under parachute. There have been some famous (in and out of the hobby) people associated with the Cineroc, besides its designer and Vern Estes, including Herb Desind (who apparently bought hundreds (if not thousands) of them), author and one of the founding fathers of the hobby G. Harry Stine, and Apollo 11 astronaut Michael Collins. It is my hope to motivate Estes to bring back the Omega, along with a 21's century update to the camera (or a shell suitable for Makers to do so). The Omega (K-52)(without payload section) kit made it's first and only photographed appearance as a stand-alone product in the 1970 Catalog on page 99 (alongside the K-52P (payload version) kit). In that catalog, the only decals visible on both kits was the black and blue fin decals. The K-52 was sold as a stand alone kit until 1972 when it made it's last appearance in the catalog. Presumably, the K-52 was what was bundled with the Cineroc for the duration of its run, but I haven't confirmed that yet. The catalog photo of the Cineroc/Omega Combination Offer (RC-8), found on page 49 of the 1974 catalog, showed a decal that had been seen on some Omega kits in some of the previous years' catalogs Omega offerings. Apparently, this decal was never included in any kit sold. Careful observers may have noticed that it looks like the booster had separated slightly (perhaps 1/4") from the sustainer in the photo. It appears that the same photo (slightly reoriented) was used in the 1975 catalog, when the Cineroc made it's last appearance. Below is my interpretation of the model in those photos. This is the version I am trying to recreate. The blue color of the decals was averaged from a sample from a scan of an actual fin decal. Tango Papa may be a source for the fin decals, along with the white Cineroc decal, and the body tube decal. Now these following images are of sims I've created of the various incarnations of the payload version of the Astron Omega (as it was called in 1970). For these, I went ahead with the standoffs (1/8" thick), but I didn't add the rail guides. The first is modeled on the 1970 catalog version of the Omega (which used a BNC-60AH (balsa) nosecone), the second shows it in the 1971 catalog livery, the third shows the early (two-piece, injection molded) PNC-60AH nosecone, and the fourth is modeled on the later (one-piece, blow molded) PNC-60AH (plastic) nosecone. 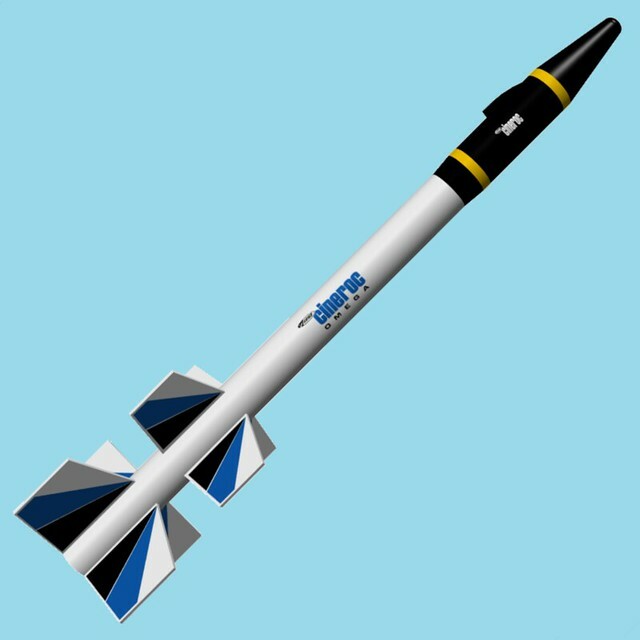 Thanks to scigs30, I've confirmed that it was issued with the two-piece PNC-60AH nosecone (injection molded in white), but have yet to locate a scan of that version's instructions. That said, if you look at the scans of the instructions on JimZ's website, the k-52a.tif image seems to show a black two-piece PNC-60AH nosecone (minus the base and eye bolt) (thanks to Mike Toelle for pointing that out). scigs30's build on YORF appears to have the base included, and other comments from people who build one "back in the day" bears this out, but the instructions seen in the k-52e.tif and k-52f.tif clearly show the one-piece nosecone. One thing to note is that the original balsa nosecone appears to be a blunted elliptical shape, compared to the blunted ogive shape of the later plastic nosecones. The stock paint scheme for the 1970 Catalog version had the payload section painted white, just like the rest of the model. I have yet to see if there's a recommended paint scheme for the balsa nosecone (it could have been black or silver), as it was photographed in black and white. There was photograph of the K-52 version w/o the payload bay and nosecone. In 1971 the paint scheme changed and the catalog had color photographs. The nosecone was black, and the payload section was painted silver. The catalog photo also had a decal on the sustainer body tube that read "cineroc OMEGA" and included the Estes logo. However, that decal was apparently never shipped out with any version of the Omega or Cineroc. There was no photograph or painting of the K-52 (w/o payload section) version in the 1971 or 1972 catalogs. The 1972 photo of the K-52P was the same as the 1971, however the image was cropped to eliminate the Astron Delta rocket that was next to it when it was photographed. Unlike the previous catalog (and later catalogs) the rocket was sitting on its bottom, and there was no gap between the sustainer and the booster. Beginning with the 1973 catalog, the shape of the nosecone may have changed to its near-final look (it appears to be a painting, and not a photograph). According to tbzep, the earlier injection molded nosecone is about 1/4" shorter than the later blow molded nosecone. Since I don't have an injection molded nosecone to confirm this, I've modeled it as if it was exactly 1/4" shorter. The cineroc/OMEGA decal didn't appear on the payload version (found on page 30), or the drawing of the Omega (without the Cineroc payload) found on page 50. In the 1974 and all following catalogs, the nosecone's shape still had a blunted ellipsoid appearance to it, but it's clear the at some time the rocket changed. First to an injection molded plastic nosecone (either in black (with a yellow hang tag) or in white (unknown hang tag color)). Then later to a one-piece blow-molded nosecone in white plastic. Also in the 1974 catalog, the Cineroc/Omega decal made its appearance in photos again, this time with the actual camera/rocket combo on page 49, whereas Omega's payload version didn't (on page 30). Additionally, beginning in 1974, the catalog image of the Omega (still K-52P) took on the purplish hue to the fin decals that some claim that it was shipped with. However, I have yet to find any evidence (e.g. : actual decal sheet, photograph, or scan), of the decals showing that they had ever been actually changed to purple. In 1975, the Omega was now kit #1200, and the decals looked as half blue (left side) half purple (right side). There is also a noticeable gap (dark band) between the sustainer and the booster in all the following catalogs that the Omega appeared in. All subsequent appearances looked to be derived from the same image as the 1975 catalog. In 1977, 78, and 79, there's a photograph of a couple ?20-somethings? (in bell bottoms) launching an Omega. Its nosecone looks to be the familiar PNC-60AH shape that it is today. The final appearance of the Omega was in 1980. The SEMROC version of the Omega with the (non-stock) payload section (not the simulated Cineroc payload section) would strongly resemble the 1970 or 1971 version of the Estes Omega (depending on the builder's choice in paint scheme). Their Omega also includes a decal saying "OMEGA SEMROC cineroc" in which the Omega is a bold font (in black), Semroc is their logo (in black), and the cineroc (in blue) is a different and smaller font size than the OMEGA. The fin decals also have a noticeably darker blue color than the Estes decals. Theoretically, a K-52P wouldn't need a standoff if it was only intended to fly just the payload section and not the Cineroc, but that wouldn't be stock, and I've seen no evidence that suggests that Estes ever altered the instructions to remove any mention of the Cineroc. "The Guide says there is an art to flying", said Ford, "or rather a knack." "The knack lies in learning how to throw yourself at the ground and miss." Launching is Optional... Landing? That Depends on Trees. Another trio of recent sims are the stock version of the Estes Vigilante (thought it looks like I might have used the wrong yellow for the fins, I checked, and it's only the way the simulation's light is oriented), my redshifted version of it (D/E Powered, W/Payload), and the BT-60 upscale (again D/E Powered, w/Payload Section). Thanks to the lack of launch lug stand-offs, engine hooks, and fin decals, the (Stock, Decaled).ork version has no error messages, and can be used for simulating flight characteristics without any oddities. [EDIT] I've been working on this again... However, I'm not 100% on the decals dimensions, but since nobody has come forth with the correct dimensions, I'll go ahead with posting this, along with a message that they are a best guess only. Also, the decal on the yellow fin required an additional "air fin" to be able to display it properly. As such, it will be for decal alignment, and not flight performance. Current time: 04-18-2019, 04:32 PM Powered By MyBB, © 2002-2019 MyBB Group.